Initially before I knew the technical names of the tables, I needed to do some detective work. I needed to find a way to go from a Web Report and find the InfoCube. In case this helps anyone out, here is what I did. Open any old BEx Web Report and get its template ID. From the BEx Web Report URL, the template ID is in the URL. 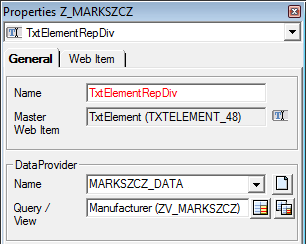 Now having the TEMPLATE_ID of Z_MARKSZCZ, open up up the Web Application Designer and open up the TEMPLATE_ID. Looking at the properties of the template, take a look at the Data Provider. Since the naming convention shows me that it’s a View, open up Analyzer. Within the Analyzer plugin in Excel, open up a Saved View (ZV_MARKSZCZ). Click on the Business Explorer: Tools icon and selected Launch in Web Browser/Query (default view). This entry was posted on Friday, September 14th, 2012 at 6:30 pm	and is filed under BW, SAP. You can follow any comments to this entry through the RSS 2.0 feed. You can leave a comment, or trackback.